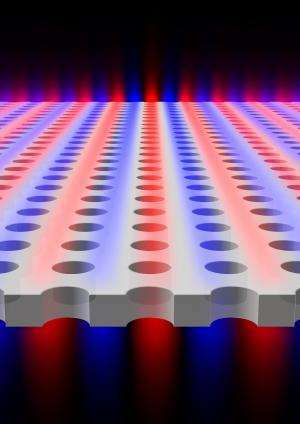 There are several ways to "trap" a beam of light—usually with mirrors, other reflective surfaces, or high-tech materials such as photonic crystals. 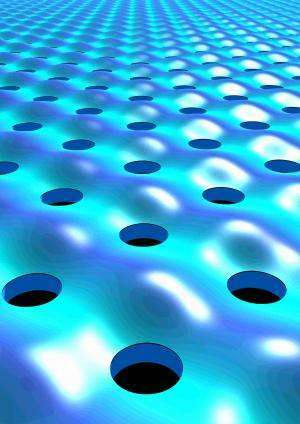 But now researchers at MIT have discovered a new method to trap light that could find a wide variety of applications. 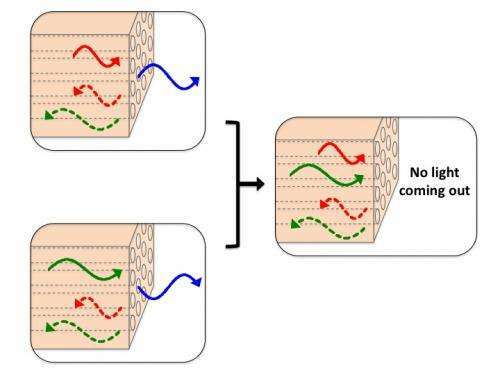 The new system, devised through computer modeling and then demonstrated experimentally, pits light waves against light waves: It sets up two waves that have the same wavelength, but exactly opposite phases—where one wave has a peak, the other has a trough—so that the waves cancel each other out. Meanwhile, light of other wavelengths (or colors) can pass through freely. The researchers say that this phenomenon could apply to any type of wave: sound waves, radio waves, electrons (whose behavior can be described by wave equations), and even waves in water. The discovery is reported this week in the journal Nature by professors of physics Marin Solja?i? and John Joannopoulos, associate professor of applied mathematics Steven Johnson, and graduate students Chia Wei Hsu, Bo Zhen, Jeongwon Lee and Song-Liang Chua. "For many optical devices you want to build," Solja?i? says—including lasers, solar cells and fiber optics—"you need a way to confine light." This has most often been accomplished using mirrors of various kinds, including both traditional mirrors and more advanced dielectric mirrors, as well as exotic photonic crystals and devices that rely on a phenomenon called Anderson localization. In all of these cases, light's passage is blocked: In physics terminology, there are no "permitted" states for the light to continue on its path, so it is forced into a reflection. In the new system, however, that is not the case. Instead, light of a particular wavelength is blocked by destructive interference from other waves that are precisely out of phase. "It's a very different way of confining light," Solja?i? says. While there may ultimately be practical applications, at this point the team is focused on its discovery of a new, unexpected phenomenon. "New physical phenomena often enable new applications," Hsu says. Possible applications, he suggests, could include large-area lasers and chemical or biological sensors. The researchers first saw the possibility of this phenomenon through numerical simulations; the prediction was then verified experimentally. In mathematical terms, the new phenomenon—where one frequency of light is trapped while other nearby frequencies are not—is an example of an "embedded eigenvalue." This had been described as a theoretical possibility by the mathematician and computational pioneer John von Neumann in 1929. While physicists have since been interested in the possibility of such an effect, nobody had previously seen this phenomenon in practice, except for special cases involving symmetry. I think it'd be neat to try this with single photon sources. Not that it'd do anything particularly interesting, but since it relies on interference, it's always fun to interfere a single particle with itself. It seems to be something akin to a "light capacitor" in that it can store up light energy, but there doesn't yet seem to be a way to release it in a controlled manner. Do you confine a wave if you cancel it out with its opposite? I am still in the dark. Is the opposite wave introduced into the system from the other end? If so where is the confinement? if not where does the opposite wave come from? Something's going to heat up. Or, cool down? Soon we will have phasers ? If so where is the confinement? The way I read it the confinement is due to the fact that the superposition cancels that wave's amplitude. So technically there is no energy to the wave that comes out (i..e the energy going in was 'confined' within the structure). Whether that actually means no wave comes out or not is sort of philosophical. Is there something left if you add two waves of opposite phase and same frequency? Or does it truly disappear? The equation says it's zero, but if you mistune one of the waves ever so slightly then somewhere (possibly very far away from the structure if the mistuning is only very slight) you will be able to find the photons again. Imagine playing billiards on a table without rigid rails but instead, the rails are made from a continuous train of same-sized billiard balls, circulating around on a track at some continuous speed. The speed of the "rail balls" has a direct effect on how a game ball will rebound. If you were to fire a continuous stream of game balls at the circulating rail balls, you would find certain combinations of the two interfering trains where the game balls are reflected precisely at the right angles to keep them in circulation- going round and round within the confines of the circulating rail balls. Well known and used in the past. 30 years ago, I remember of a large restaurant, very noisy, becoming quite silent and quiet, simply with holes in plates in its ceiling !! could you make a transistor out of this? Also some famous American-Chinese "researching" gang at MIT is stealing both the ideas and money of taxpayers. It consists of numerous swindlers from David H. Koch Institute for Integrative Cancer Research and Department of Chemical Engineering, also with Department of Chemistry and Chemical Biology and School of Engineering and Applied Science of Harvard University at http://issuu.com/...vard_mit and http://issuu.com/...llsens12 . Their plagiaristic "masterpieces" titled Macroporous nanowire nanoelectronic scaffolds for synthetic tissues (DOI: 10.1038/NMAT3404) and Outside Looking In: Nanotube Transistor Intracellular Sensors (dx.doi.org/10.1021/nl301623p) were funded by NIH Director's Pioneer Award (1DP1OD003900) and a McKnight Foundation Technological Innovations in Neurosciences Award, also a Biotechnology Research Endowment from the Dep. of Anesthesiology at Children's Hospital Boston and NIH grant GM073626, and NIH grants DE013023 and DE016516.